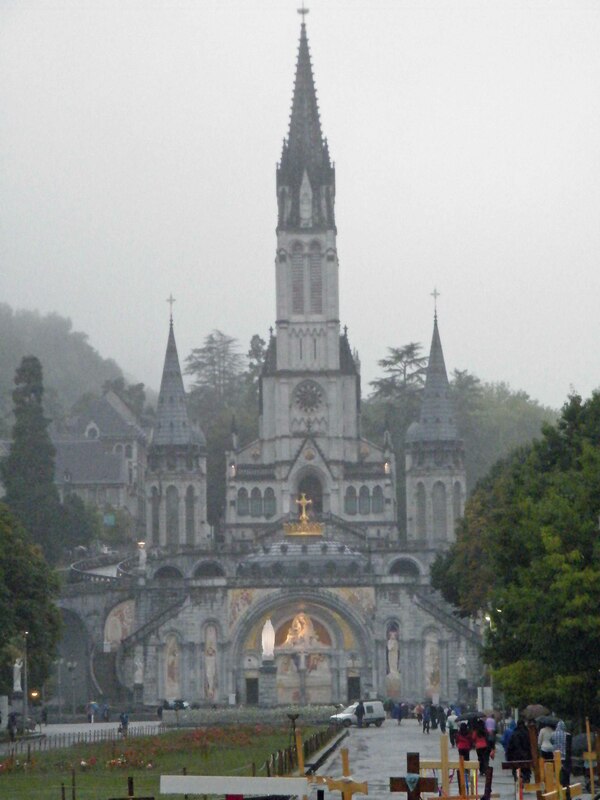 When I told friends I was visiting Lourdes, their reaction was one of general “oh that’s interesting” and the conversation moved on to other topics. This in itself is interesting because even though it is probably one of the most important places for Roman Catholics to visit and it receives something like 5 million visitors every year; to many it is a place name they are familiar with but that’s about it. For my part, I am not Catholic and like many, not especially religious either. But with the need of a stop over en route from Santander to our French gite, I saw it as an opportunity to enrich not only my but also my family’s mind and knowledge of important places. I had a pre-conceived idea of what it was going to be like and I went armed with headscarf and suitable clothing appropriate for such a sacred place. 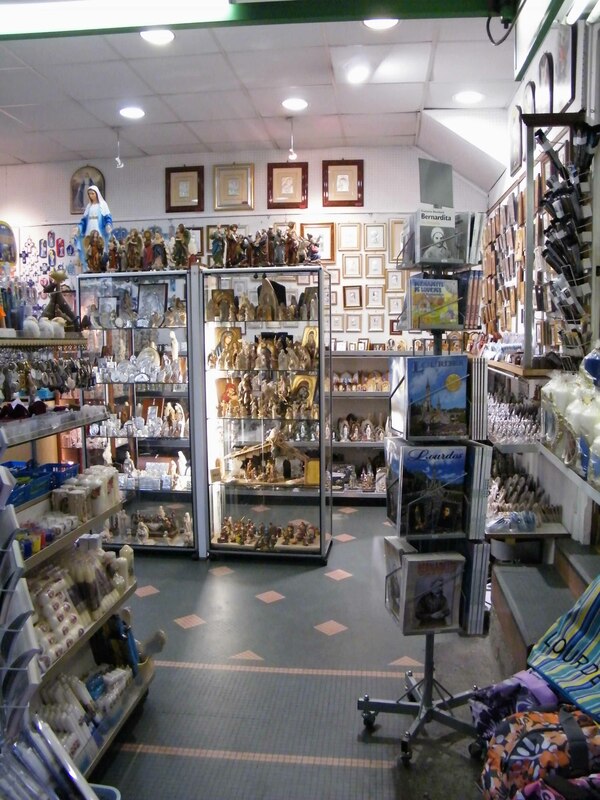 However, the reality of this reverential site was hugely disappointing to me and I felt any veneration that may have once been offered to the miracle of Bernadette’s apparition, was being denigrated by the never ending greed of commercial enterprise. We stayed in the Best Western Hotel Beausejour which was pleasant enough, but within a few minutes’ walk we found ourselves bordered by shop after shop selling the worst type of trinkety tat imaginable. 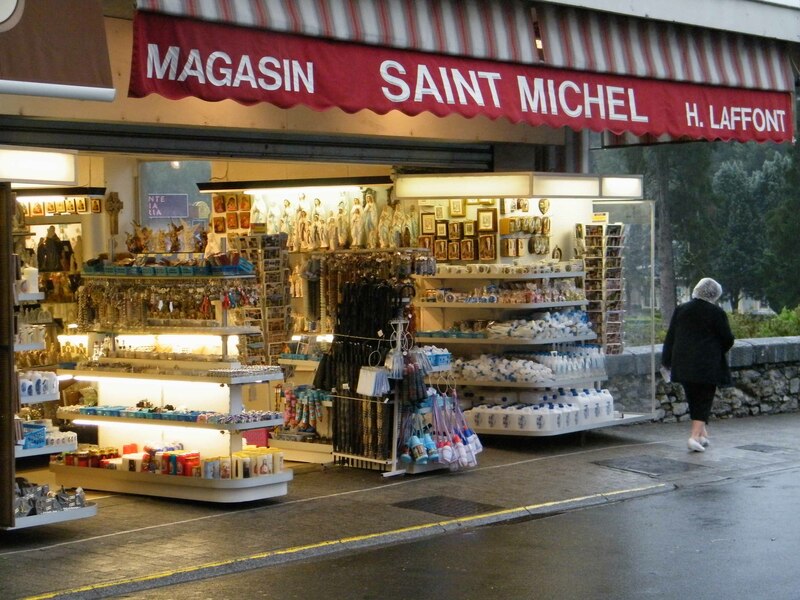 From ornaments of the Virgin Mary to T-shirts with a multitude of saints printed on the front, the entire street was little more than a trashy market selling tacky worthless junk. I was already beginning to feel a little cheated out of what I had imagined would be something of an enlightening experience. Sadly my disillusionment was yet to be completed. 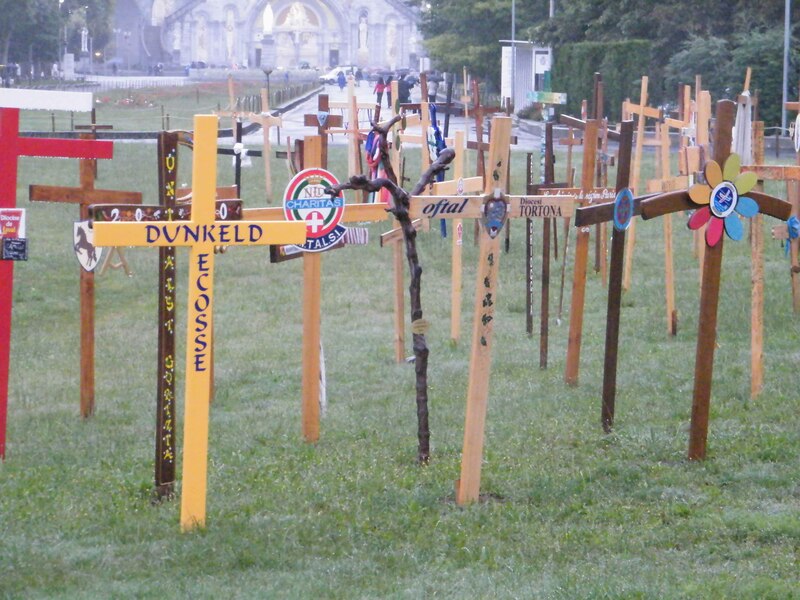 Having crossed the bridge over the river Gave de Pau we faced a very touching and poignant scene; a large circular lawn, in the middle of which was a life size statue of Mary and all around, lodged into the ground, were dozens of large crosses with names of loved ones who have died. However, beyond this moving picture of sadness was a view that reminded me of the entrance to Disney World Florida. You know the one, where Tinker Bell flies around the castle and waves her magic wand. It would seem they not only built one church above the ‘cave’ but a whole host of different sized and shaped places of worship, resulting in a graduating structure of towers and steeples and in the middle of the complex is a larger than life gold coloured crown. We visited each church, some of them busy with an ongoing service, others devoid of life other than the multitude of tourists. However, I was astonished to witness a church ‘warden’ tap a large key loudly on the back of a pew directing a nun who was in silent prayer, to vacate the building as it was closing time. Not even an opportunity for a last order. Having been ushered out, we made our way down to the cave, on the way passing a long row of taps where people were taking everything from small sips of water to filling several very large containers. The cynic in me might ask why anyone would want such huge quantities, but perhaps that’s just me. We then passed several kiosks selling candles and very small glass bottles (back to the taps) and then finally we came to the cave. I joined the back of the queue and we all shuffled forwards at a snail pace. It wasn’t exactly an orderly line, more of an amoebic crawl as groups and couples discreetly merged and queue jumped not wishing to miss out on any possible new sightings. 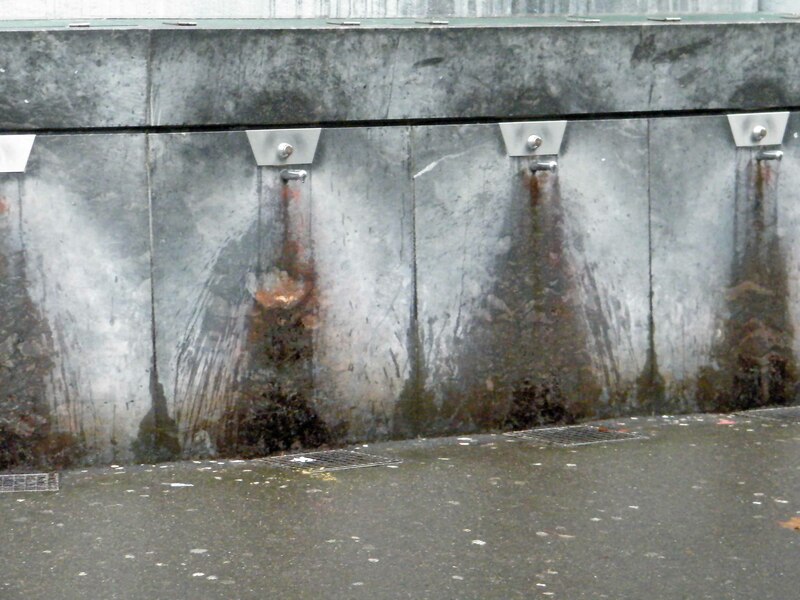 The location is more of a grotto than a cave and every surface has been rubbed into a smooth greasy grey where people have run their hands along its surface. I saved my cave wall rubbing until the end where there was a small trickle of water running down from the exact point the apparition took place. With a quick and judicious whisper to any kindly saint that may have been listening to us pilgrims, I quickly moved along the barricade to allow those following the opportunity of another gentle douse. I can’t say I felt the illumination I was hoping and whilst there was a very great deal of sombre mood, song and prayer, it seemed to me to lack a certain, as the French say, je ne sais quoi and rather than feeling virtuous for having shuffled obediently along amongst the throng of true believers, I felt a little disillusioned and dare I say disheartened that something so pure and simple has been propelled into the capitalist way of thinking we all now fail to avoid. 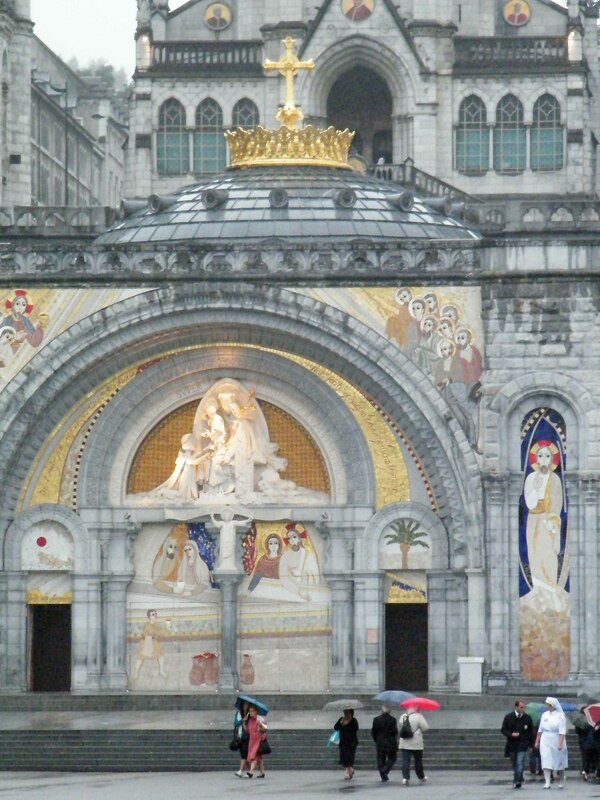 This entry was posted in Holidays & trips away and tagged Bernadette, cave, Christian, church, cross, France, Gave de Pau, holy, Lourdes, Mary, nun, pilgrimage, pope, religion, roman catholic, saint, Virgin, water. Bookmark the permalink. 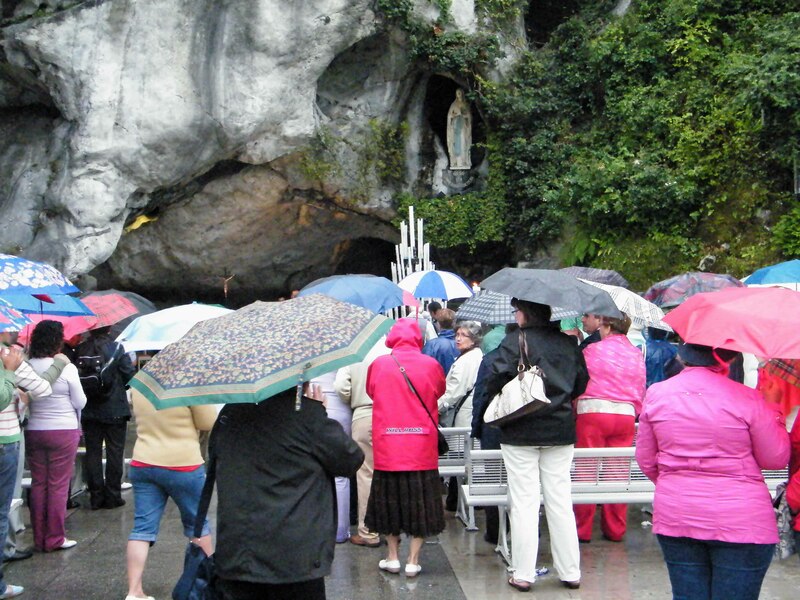 4 Responses to Lourdes France, a place of pilgrimage or commercial enterprise? A very interesting article Sophia. I remember going there as a child many moons ago and being overwhelmed by the crowds of tourists rather than any holly feeling I was maybe expecting. 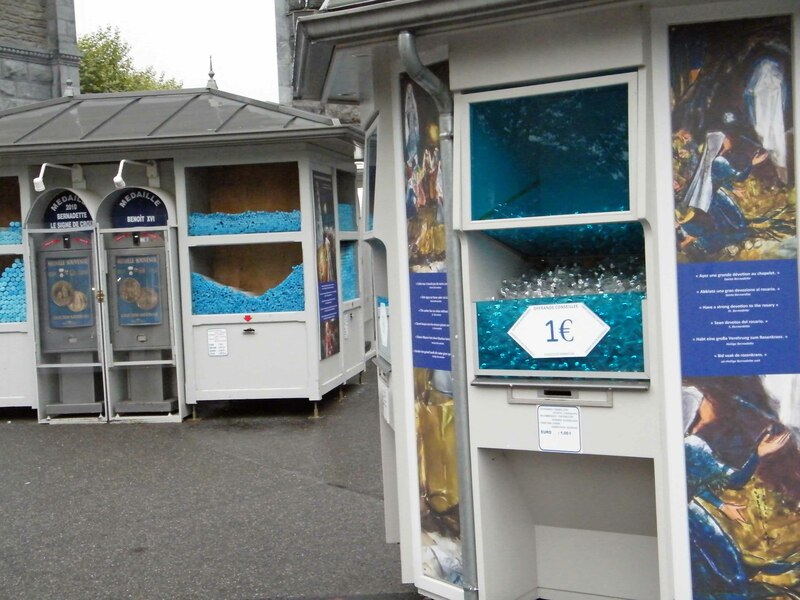 The rubbish sold at all these places -Mont St Michel’s plastic swords being another example- does live a bitter taste of never again in my mind. Shame, whether holly, ancient or once beautiful. Thanks Nathalie, I quite agree it is very sad that these places are turned into money spinners, there is something rather immoral about using a person’s belief and vulnerability in order to make money. I thoroughly enjoyed this post Sophia. I was brought up as a Catholic and was fascinated by the story of Bernadette and even chose this as my confirmation name. 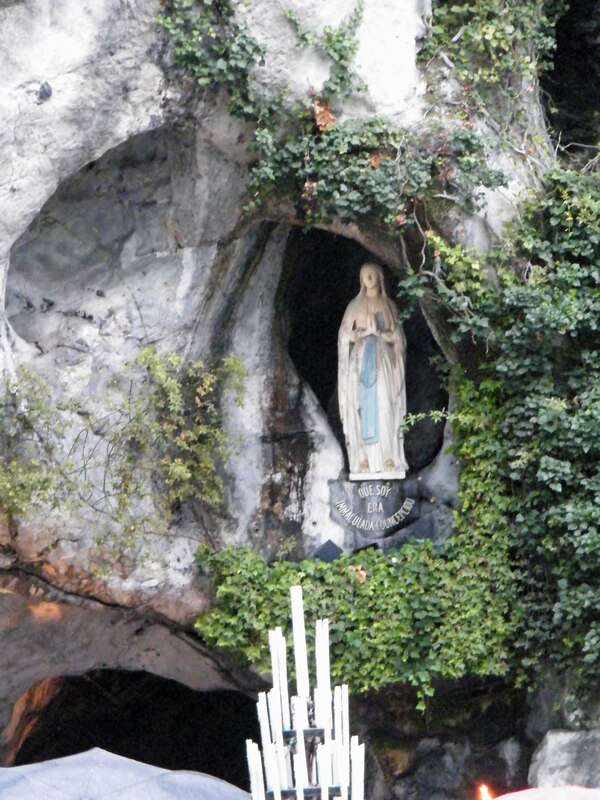 I’ve never visited Lourdes but have heard similar descriptions which makes me less inclined to go to the site and satisfy my curiosity. Thank you Helen. I think it’s one of those places you feel you have to/need to visit to see for yourself. 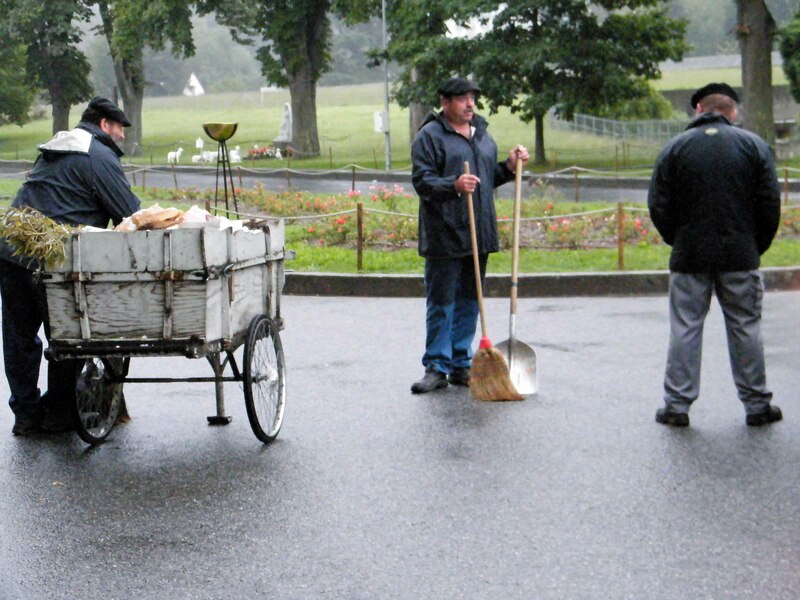 It is a pity there is so much commercialism of the area, but I think that is nothing new – more’s the pity. I am still glad I went, as the saying goes “I’ll never die wondering”.